We drove five hours from Embu to Materi Girls High School today to visit Jackline and Linet, two of our high school students. It did not take longer than a minute to begin to feel our blood and skin searing through the windowpane as a result of the piercing equatorial sun. 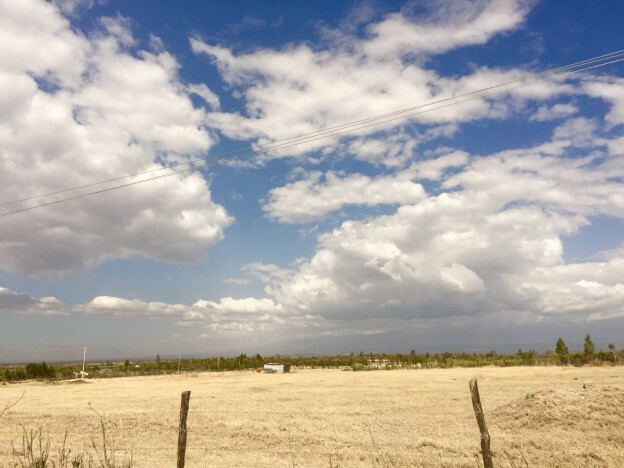 The black tarmac quickly turned to a less than organized collection of dirt, rocks and dust. If someone told me I was now in Sudan, I would have to believe that to be true. My head started to pound. Intuition told me I needed water – that this was heat related and and I had to hydrate. When the plastic rim of my bottle touched my lips, cool maji (water) poured into my mouth. What a treasure on earth! I eagerly took in the life force, feeling as if there would never been an end to the need I felt inside of me. All the while, the sun’s relentless rays worked on me. Dust sputtered into our car through every opening possible. My black leggings were now sporting multiple brown layers of dust everywhere opened to the elements. My recently washed hair lost any sign of cleanliness or shine – and in fact, it felt horribly dry and dirty to the touch. My head itched from the barrage of dust attacking us. We persisted on. “Samahani” we asked the one and only man on the road “Is this the way to Materi Girls?” “Yes” he replied. “Straight ahead”. The road had no markers. It’s loose dirt road split in two. Rocks protected one from making the mistake of falling down the huge drop off to our right. So it was straight we stayed. After 10 minutes we felt as if we were no father into the middle of nowhere as we were before. “Is this the way to Materi Girls” we asked a woman near the roadside. “yes, straight ahead.” she replied. Again, we moved forward leaving what looked like a disappearing road in a cloud of dust behind us. Why do we travel so far? We are going to visit two girls – both of whom we officially have gifts for but only one whose gifts we will be delivering today. It doesn’t make sense, really. I mean traveling all this way – while gifts for the other girl remain stuck at port… now entertaining their 7th week late – in the container… but we don’t know when they are coming and we must deliver the gift we have. 3 books to be exact. That’s what we have. 3 books. 5 hours. Dust. Heat. But that’s our promise. Every year sponsors send us with packages of hope for their students. Packages to encourage them and help them survive and thrive throughout the year. We will do everything possible to see your child and to deliver the gifts you send with us. Rest assured. Eventually our tires sputtered through a metal gate where the guard for Materi Girls first interrogated us and then welcomed us to park at the school. We coerced our overheated bodies out of the vehicle and onto the dusty plain. The first step assured the elements a new home in our socks and shoes. It felt great would be a lie. Our first stop was the principles office. To our surprise, he was so nice and even offered us soda and lunch. (In all of my 10 years traveling to Kenya for Matanya’s Hope, this is only the second time this has ever happened!). Soon we found ourselves with Jackline and Linet. I don’t know if our smiles filled the room or my heart more! I think all were bursting with joy! 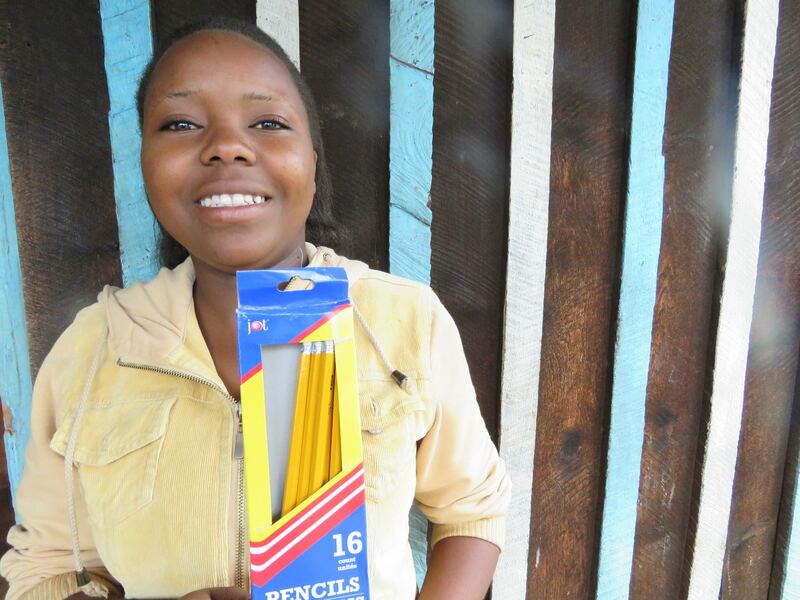 Jackline receiving pencils from your generous donations! We gave Linet her gifts and made sure to share the few general donations we’d been able to preserve with Jackline too. We let the school know that we had also brought some supplies to donate to about 50 girls in need and soon found ourselves handing out pencils, sharpeners, rulers and folders to a beautiful green uniformed population of grateful students. I can’t write more without thanking you, our donors, for making it possible to bless the needy. 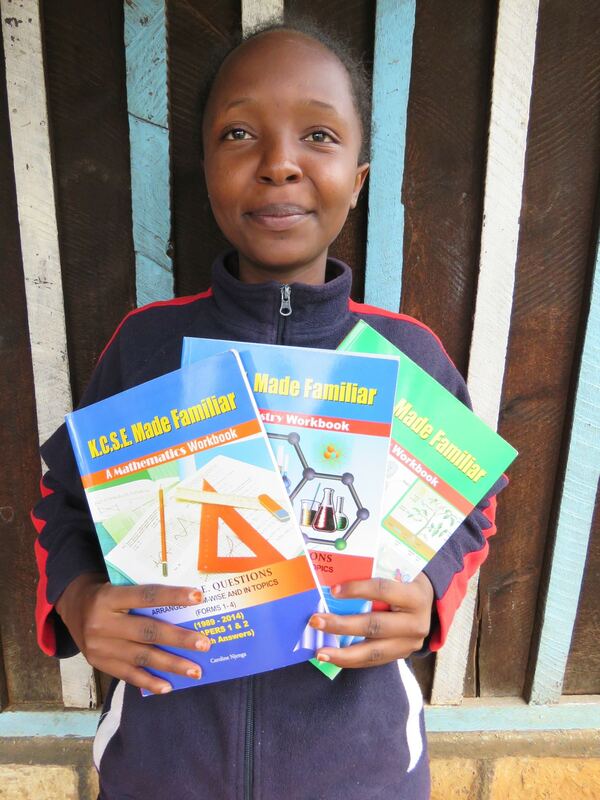 In addition to her sponsor gifts, Linet receives 3 revision books she requested to aid her in her studies. Time was pressing us and we were clear our visit had to end. After sweet goodbyes, we entered the vehicle with a huge gift. The school gave us 2 bottles of water to carry. I sit here now, not drinking it, but instead, I have placed the small plastic bottle behind my neck. Can I tell you the relief as the 70 degree bottle is actually cooling my sun beaten body. This entry was posted in Uncategorized on September 16, 2015 by Michelle Stark.